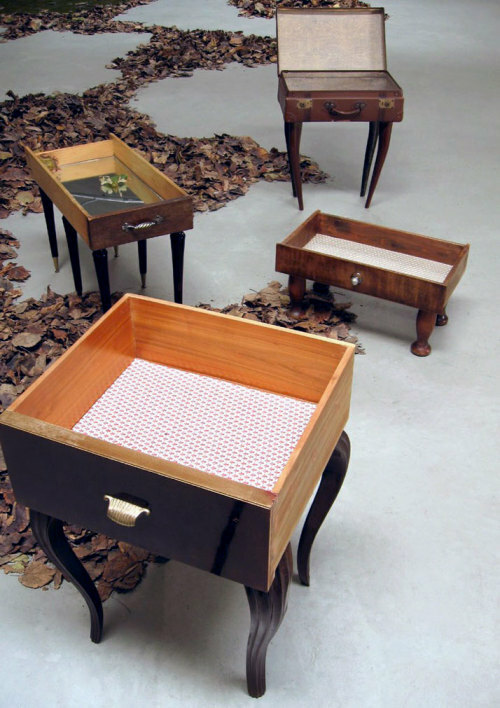 These little DIY drawer tables are one of those things for me…so super cute with little legs just ready to start walking. They seem like quirky little animals. Titta på dessa små DIY låda/bord… så super söt med små ben bara redo att börja gå. De verkligen ser ut som excentriska små djur. These remind me of The Beauty and the Beast! Remember that little walking footstool?! Very Cute. I looked at the tables and imagined they walking! Those ARE lovely !! Would be so much fun for a kids' playroom/bedroom or for sidetables too. Great find! Oh Wow! Those are the cutest little drawers and that suitcase! They do look like they are walking in a procession! How fun – thanks for sharing!